Background: Aloe vera has been used as a medicinal plant for several hundred years. Aloe vera gel is a rich source of certain bioactive polysaccharides which are essential for immune-therapic activities. Aloe vera gel is prone to bacterial activities which could reduce its storage life due to high water content (97-99%). Drying is the main operation for the dehydration of aloe vera gel but it could significantly affect the physicochemical and structural properties of dried aloe vera gel which in turn may alter its functionality. Individual drying processes like hot air and microwave drying, often fails to retain the quality of dried gel. 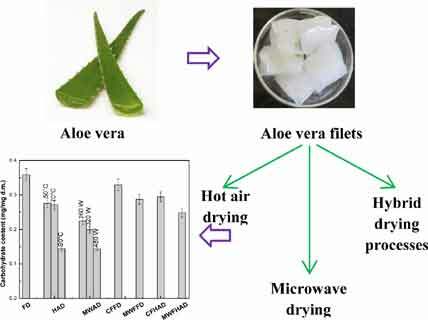 Methods: Dehydration of aloe vera gel was performed using hot air, microwave-assisted, and hybriddrying processes towards the retention of its physicochemical and functional properties and, the statistical data analysis was performed by ANOVA to understand the effect of drying conditions on its quality. Results: Among all drying techniques, ‘centrifugation followed by freeze-drying’, and ‘centrifugation followed by hot air drying’ showed the highest carbohydrate and protein retention in dried aloe vera gel of 91.8, 82.3% and 90.9, 85.6%, respectively. Microwave input power did not alter the water retention capacity, but its higher value reduced both swelling property and fat adsorption capacity. However, all these functional properties gradually fell down with the increase in temperature of hot air drying. Conclusion: Carbohydrate, protein contents, and functional properties were sensitive to hot air drying temperature (>70 °C) and microwave power input in microwave-assisted drying (>160W). Retention of higher swelling and water retention capacity in hybrid techniques implied that the structural modification of the dried matrix was less affected. Aloe vera gel, dehydration, hot air drying, microwave, hybrid drying techniques, functional properties. Department of Chemical Engineering, Indian Institute of Technology Guwahati, Guwahati 781039, Assam, India.